finally i realized what snowboarding is approximately about. i thought i knew from the first day, but i was wrong. in the first days all i did was brrrreak, turn, brrrreak, or slide laterally out of control, brrreak, turn, brrreak. this weekend i went with L&C to Flims, for half a day. it is unbelievable how much you forget at the initial stages of learning a sport. and the gap is big, as you remember the last images with you being better at the end of the previous day, only to have an utter disappointment the next time you go. saturday i barely had time to get a bit in control, and the day was over. 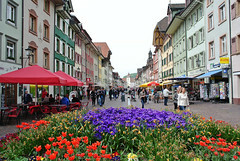 the good thing was though, i went on sunday, to flums, which is closer, and managed to wake up and go in the morning. it made a world of a difference. stayed on the blue (easy) slope for a few times, till i finally managed to “connect” some curves, into a very pleasant slalom. ahaaa! so that’s what it is about. speed improved as well, so i didnt have to run over the flat areas any more, which was extremely annoying. then i went on to the red slope, which is waaay longer, and therefore very enjoyable. steeper, but ok.
now i’m curious, next time i go, how bad the first descent will be. till then, a few pics below, taken with the phone camera. March 12, 2008 in sports.